The diagram below shows electrical connections on a tile. Again, if you are making your own board or using a prototype board you can connect Tibbits in any way you like (as long as it doesn't cause them to smoke and burn). The diagram illustrates our own structured approach to building things with Tibbits. 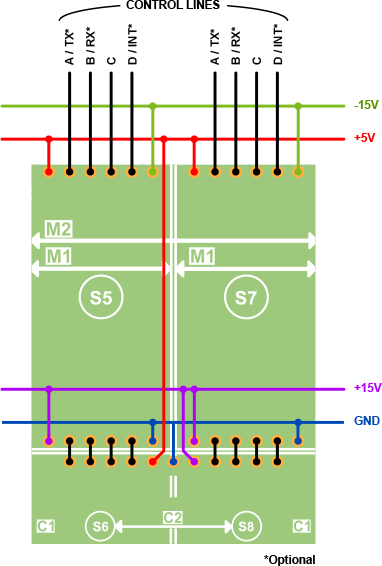 GND, +5V, +15V, and -15V rails were already explained in Tibbit Power Lines. Eight control lines of the tile -- four per "M" socket -- go to the TPP's CPU. "C" sockets and "M" sockets are interconnected directly (see eight short black lines).